The Jewish authorities in Jerusalem sent some priests and Levites to John to ask him, "Who are you?" John did not refuse to answer, but spoke out openly and clearly, saying: "I am not the Messiah." "Who are you, then?" they asked. "Are you Elijah?" "No, I am not," John answered. "Are you the Prophet?" they asked. "Then tell us who you are," they said. "We have to take an answer back to those who sent us. What do you say about yourself?" John answered by quoting the prophet Isaiah: "I am "the voice of someone shouting in the desert: Make a straight path for the Lord to travel!' "
Sometimes at this time of the year we see a town crier especially at the head of Christmas parades and pageants. In one of the towns we lived the annual Christmas parade was always led by the town crier crazily ringing a bell and calling out "Oyez! Oyez! Oyez! 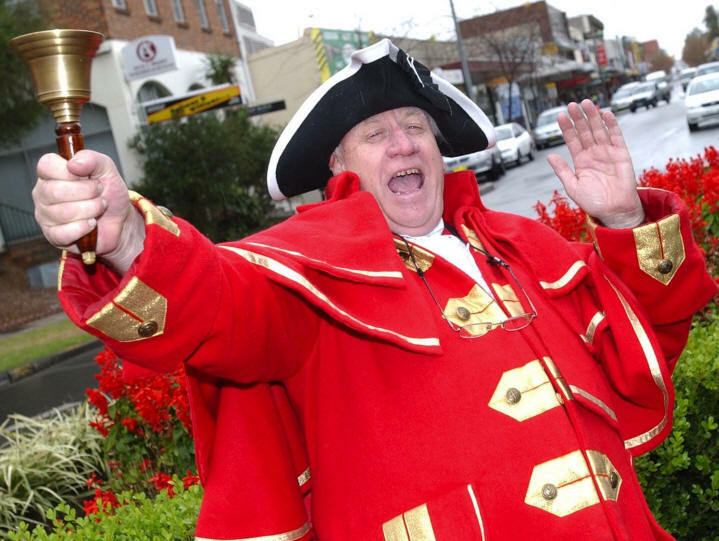 Merry Christmas’ (Oyez is the traditional call of a town crier. It is French for ‘listen’). When we heard the bell and the shout from this man we knew that the parade would soon be passing by. Now suppose for a moment that you had never seen anything like this before. Here is a man, usually an elderly man, dressed up in a bright red coat with lots of gold braid and gold buttons and a cape that is thrown over his shoulder. He has white trousers with a red stripe running down to his very shiny black shoes. These shoes are a bit strange as they have quite high heels (for a man’s shoe) and a big gold buckle on the front. On his head is a black three cornered hat with white braid around the edge. You could quite easily believe that you were seeing a character from an old movie or perhaps you have been transported back a couple a hundred years or more when town criers were an important part of the community. He was usually the person who delivered the news of what was happening around town or important proclamations from the king. So why would a grown man dress up in such a weird costume? It is quite a hot day but this doesn’t seem to bother the town crier. He happily does his job even though he’s dressed in such a way that would suggest a cold English day rather than a hot Australian summer. Now imagine you have never encountered someone like this, in fact, you come from out of town where the Christmas parade is led by a row of Christmas pixies in very short skirts. When the parade is over, the man in the red coat walks among the crowd shouting and ringing his bell. He is quite close to where you are standing. Here’s your chance, what will you do? Since you’re not quite sure who he is and what he’s on about, you could him ask him a question or two. Ask him why a grown man is dressed up in that crazy outfit on a hot Australian day? Ask him if he is one of Santa’s helpers, and if he is, why does Santa need someone else to go around shouting ‘Merry Christmas’ when he does it so well himself. Ask him why he needs to shout so much and annoy everyone with that bell - hasn’t he heard of microphones and public address systems. Another thing you could do is simply let him get on with his job. He might look silly in that outfit and he might look like a drop out from the 18th century, but he doesn’t really want to stop and chat. He has a job to do wishing one and all a ‘Merry Christmas’ and all he asks is a ‘Merry Christmas’ in return as he makes his way through the crowd. In other words, don’t bother him with too much chitchat and let him get on with his job. John the Baptist is God's town crier. His outfit must have seemed equally crazy to the people of his time. No red coat and three cornered hat for John, only clothes made out of rough camel hair. He looked like a prophet from centuries before his time. Unlike the well rounded belly of the man with the bell, John was untidy looking and mostly likely quite slim since his diet consisted of locusts and honey. But like the town crier he had a big voice. He didn’t lead parades and he didn’t wish everyone a ‘Merry Christmas’. His message was a much more serious one. ‘Turn away from your sin and get ready for the one who is coming soon. The one who is coming is much greater than I am. He will baptise you with the Holy Spirit’. The people who came to listen to John’s message let him get on with preaching, baptising and proclaiming the coming of the Messiah. And most people were happy to do this. But not the priests and Levites. They have been sent down from Jerusalem to ask John some questions. They aren’t going to return without answers and so are not happy to just listen to John’s message. John had something important to say to them but they weren’t listening. They proceed to quiz John. "Who are you? Are you Elijah?" "Are you a prophet like Moses?" Again they ask him, "Tell us who are you? We have to take an answer back to Jerusalem." He answers, "I am the voice of someone shouting in the desert: Make a straight path for the Lord to travel!" Again John is asked, "If you are not the Messiah, nor Elijah, nor a prophet like Moses, then why are you shouting out that people must repent and be baptised." John insists. "I am only a voice. I’m not important but the message I bring is. I am a messenger sent by God. If you like, I’m God's town crier. And like a town crier I have a message from the king for everyone to hear. My job is to faithfully shout out this message so that everyone is ready for the One who will soon come." But the priests and Levites just don’t get it. For all their questions and John’s honest answers, they miss the message - they miss the message about the Saviour who had come into the world for their sake. They miss the message that Jesus was coming to bring God's love and forgiveness to them. Like the people in Jesus’ time, we are also in danger of missing Jesus. The priests and Levites heard John calling out. John had answered their questions very clearly. They knew all the prophesies and promises of the scriptures but they still didn’t hear what John was telling them. They couldn’t hear God speaking to them through John’s words. They didn’t hear that their Messiah was coming. They were distracted by their own ideas about God and how he would speak to his people. We are in danger of doing the same thing. We know all about Jesus. We know the promises and the prophecies. We know who Jesus is, what he did, what he said, how he died on the cross and rose again. We know all that - but we are in danger of missing seeing him as our Lord and Saviour. We know about the baby born in stable but we are in danger of not hearing the message that this baby is God come down from heaven for you and me. This baby is God's personal message to each one of us telling us that he loves us and invites us to trust his love and rely on his presence in our lives at every bend along life’s journey. We are in danger of knowing the Christmas story so well, that we fail to see its real message – God has come as a baby in a manger for us – for you and me. It’s not just a story it’s about God connecting with ordinary people like us. We can get to the end of the Christmas season thrilled about the wonderful celebrations we have had with our families and friends, excited about giving and receiving Christmas gifts and amazed at the effort people have gone into setting up their Christmas lights and Christmas trees but in fact we have missed the whole point of Christmas. Like the priests and Levites we didn’t hear the message at all that the baby in the manger tells us. We have missed out on the true wonder and joy of Christmas, namely that God became a human for us. If you only had one light on your Christmas tree then it would stand out, and everyone who looked at the tree couldn’t help but notice how brightly that one light was shining. But put that light in amongst a whole string of lights on your tree and it no longer stands out. The light it gives is overwhelmed by brightness of all the other lights. That can easily happen to us as well as we hear the message of Christmas. The economical and political news is so overwhelming and constantly in our faces when we turn on our TVs or read the newspapers. ‘Spend! Spend! Spend!’ is the message the government is telling us to kick start the economy. The message that retailers keeps on telling us is the news of sales and cut prices on items that ‘we really ought to have’. We keep telling ourselves the message that we have to make this the best Christmas ever. All this, and more, leads us to admit that like the single light on a Christmas tree that is overwhelmed by the brightness of all the other lights, likewise our hearing of the real message of Christmas is drowned out by so many other messages around us and from within us. We ask God to help us to really tune in to what he is telling us through the Christmas story and not allow the good news of Christ’s birth be drowned out by all the other voices and noises clamouring for our attention. The message that is loud and clear is that a baby born in Bethlehem has come to bring peace to you and me – people who are troubled by sin. The message of Christmas is clear God's Son came into the world to die for us and forgives us. His birth is about what God has done and continues to go for you personally and individually. We are thankful that God sent a town crier like John the Baptist to once again draw our attention to the love and grace of God that caused him to send his only Son to become a human like us so that he might free us from sin and death. We are thankful that God has given us a new town crier, the one that John spoke about, the Holy Spirit, is speaking to us again today with a message that urges us to turn away from our sin and welcome Jesus into our hearts and lives not just once but every day. May we also be town criers and shout out aloud the true message of Christmas to one and all, "Oyez! Oyez! Oyez! Christ who was born in Bethlehem is our Saviour and Lord!"